Installation, Reset and Calibration of the V200 Feedback unit. A Customer will call saying that the FB unit will not range the full 4 to 20mA, or an error message will appear on the metering device. There are a few things that we can do to trouble shoot this problem. Small adjustments with the trim pots marked (span & zero) will help to fine tune the FB. If you still are having problems call VAC at (205) 678-0507 for more support. A recent question that has come up a lot recently is where do we find device drivers for the D400 for AMS Software? The answer is Emerson or AMS should provide these drivers, the D400 will not be listed but the ABB TZIDC will be listed. In this issue of the VACPAC Product news we will be reintroducing the retrofit contest for 2012, technical tips from Matt Dill, and some information about device drivers for the D400. Thank you all for a great start to 2012, and thank you for your continued support. At VAC we have continually promoted the retrofit market with ads in industry magazines and our retrofit brochure. Why? Here are just a few points. 2.Can open opportunities into a plant that you are currently not selling valves. 3. Saving customer headaches due to lead time and price point from originally supplied positioner. 4. You will walk by more valve packages in the field than you will ever sell. Last year we had a retro fit picture contest in which very few people entered pictures. We want to try it again with a bigger prize and clearer definition of what VAC is looking for. VAC is looking for a BEFORE and AFTER picture of a retro fit application. 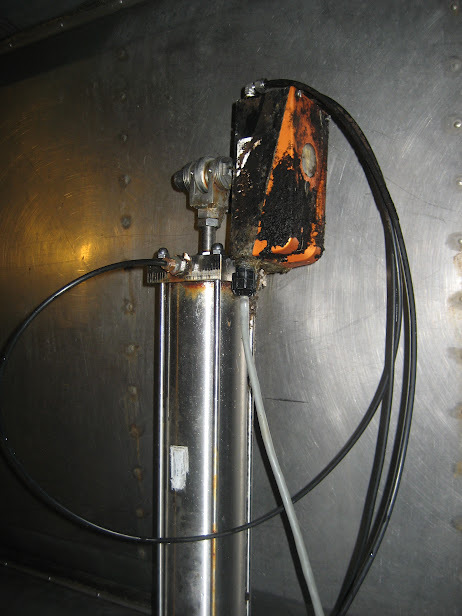 A retro fit application is a valve package with a valve, actuator, and positioner. The BEFORE picture MUST include a competitors positioner, then the AFTER picture should include the VAC positioner on the same valve and actuator in the BEFORE picture. We will also need the serial number that is associated with the VAC positioner, this will help us keep track and not allow someone to use the same positioner on several different pictures. VAC would prefer to get a "real world" picture, in other words a picture that comes from a plant, that is why we will give 5 points for each submission that comes from a plant setting. Below is an example of a 5 point submission, first picture is a cylinder actuator with competitors product, then the same cylinder with a V200. However, we understand that a lot of retrofits are done in shops, that is why we will award 1 point per entry when a submission comes from a shop. You must have a total of at least 15 points in order to win the prize. So for example if you submitted 2 plant pictures and 5 shop pictures that would be a total of 15 points and you would be eligible to win the prize. The winner is the one with the most points. The prize will be a $1,000 gift card to either Best Buy, Golf Galaxy or Cabelas. The winner will get to decide which store they want their gift card from. We will announce the winner in September. The cut off date to submit pictures is August 31st. You can submit pictures and serial numbers to Retrofit, Tammie, Randy or Wayne. If you have any questions please contact us at 205.678.0507. On March 6th and 7th VAC hosted its day and a half training class from customers from all over the country. Pictured from left to right are Jamie from Pipe Products, Ron from Crane Engineering, Mike from AC Controls, Jesse from Ferguson, Kevin from SISCO, and Zach from AC Controls. We want to thank everyone for attending, and if you are interested in attending or sending someone please contact any of us at VAC. The May class is officially full but we have room in our August 7th and 8th class. Thank you for your continued support of our product line. If you have any questions or would like to get more information. such as product brochures please call us at (205) 678-0507. You may also visit our website for more information, (click VAC to be redirected) Valve Accessories & Controls.